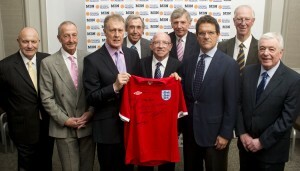 The (remaining) ‘Boys of ’66 squad’ presented Fabio Capello with a signed England shirt. 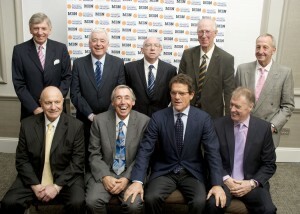 I was there for MBN, the FA and the National Football Museum. He seems a very ‘hands-on’ bloke and his English is getting much better. I set up the ’66 squad and a space for him to sit down (we only had Fabio for 30 minutes; he didn’t stay for lunch) and down he sat and grabbed Gordon Banks and Geoff Hurst’s knees. There was no need for me to ask them to smile. The room was very crowded so I had to use a wide angle lens and bounce the flash off the ceiling (I say ‘flash’, it was an Elinchrom 500 flash head plugged in with a radio transmitter – I could light up the whole room no matter who he decided to put his hands on).